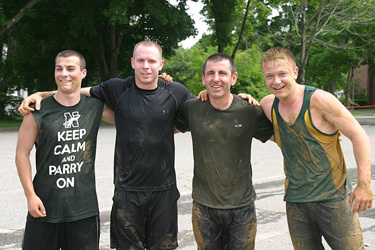 A Nashoba-based team took first place at the Wolverine Challenge in June, thanks to capturing five of the top eight places in the mud-filled obstacle-style course. A Nashoba-based team was the hands-down winner of the High School Wolverine Challenge held June 16-17 in Spencer, MA. The team included students, faculty, parents and friends from the Nashoba Community competing in the five-mile, muddy obstacle course on Sunday. Nashoba’s win was secured by the first place finish in the men’s division by 2013 graduate Ben Mandelbaum and third place by teacher Matt Ettinger. There was also a first place award in the women’s division by junior Emily Sargent, followed by second and third finishes by two Nashoba moms, Maggie Bonazzoli and Robin Schartner. The team award was calculated by the finishes of the top four runners from each team. Since Nashoba took five of the top eight places, hoisting the cup was assured. 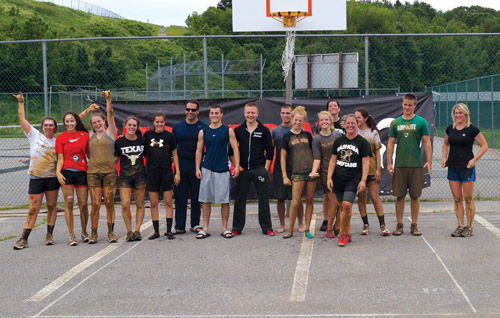 The course wound through David Prouty High School steering participants over obstacles such as constructed wooden walls, monkey bars, mud crawls and even a slip-n-slide with a muddy pool at the bottom. Ben Mandelbaum on the Wolverine Challenge course. Also on the Nashoba team was Stow resident and Nashoba school system teacher (and Nashoba graduate) Linda Gothie who competed with her son, Greg, a junior at Nashoba. 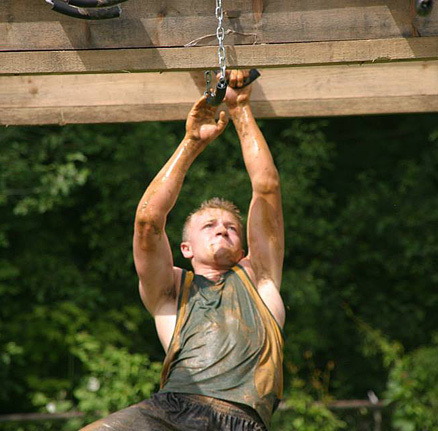 “I had always wanted to try one of these races with military obstacles. I got my mind set and wanted to do it to say I did it,” she said. Gothie hurt her leg partway through the race, but she was determined to finish and began walking the course. As she approached the last portion of the site where participants run up and down the bleachers, she saw Greg standing there. “He had shoulder surgery last year, I thought he was hurt,” she said. When she asked Greg if he was okay, Greg told his mother he had already finished the race and came back to find her. “He finished the race, but climbed all the walls and did the last third again with me,” she said. Nick Piccioli, Matt Ettinger, Steve Kendall and Ben Mandelbaum after the Wolverine Challenge.